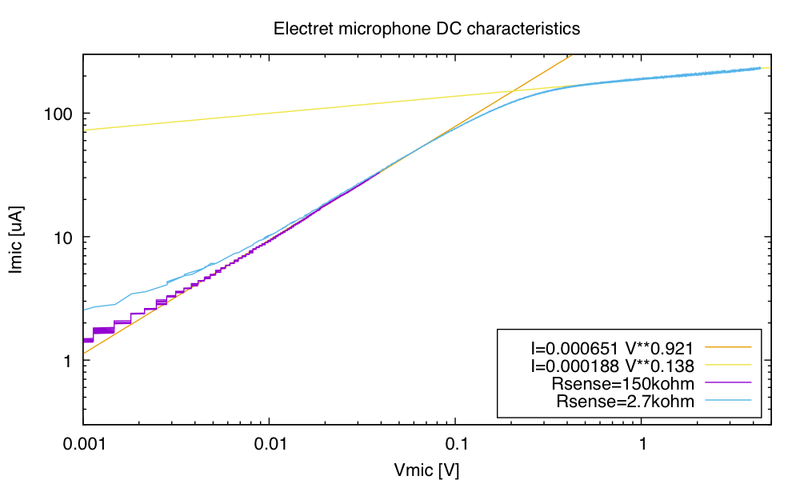 I-vs-V DC characteristics for an electret microphone. The linear and saturation regions are nicely distinguished and there is little noise. The hysteresis observed here was unexpected. The loop is traced clockwise, with the upper curve for increasing voltage and the lower curve for decreasing voltage. At first I thought that the effect was a thermal one, like I saw when characterizing power MOSFETs, but a thermal phenomenon would get more pronounced at slower sweep rates (more time to heat up and cool down), while the hysteresis here could be reduced by sweeping very slowly. 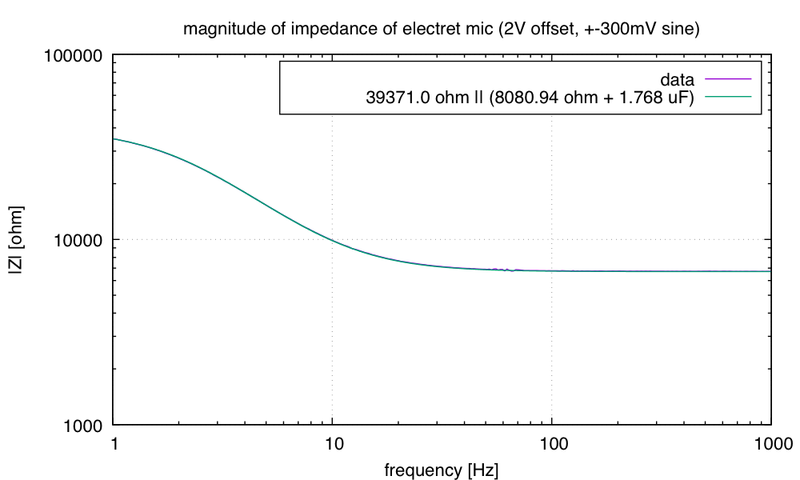 Also, the hysteresis did not rely on running large currents—the mic was dissipating less than 1mW at the most, and changing the voltage range did not change the hysteresis much. My next conjecture was a capacitive effect, which I tentatively confirmed by either adding a capacitor in parallel with mic (increasing the hysteresis) or a capacitor in parallel with the 5.1kΩ sense resistor (which reduced the hysteresis or even reversed it). 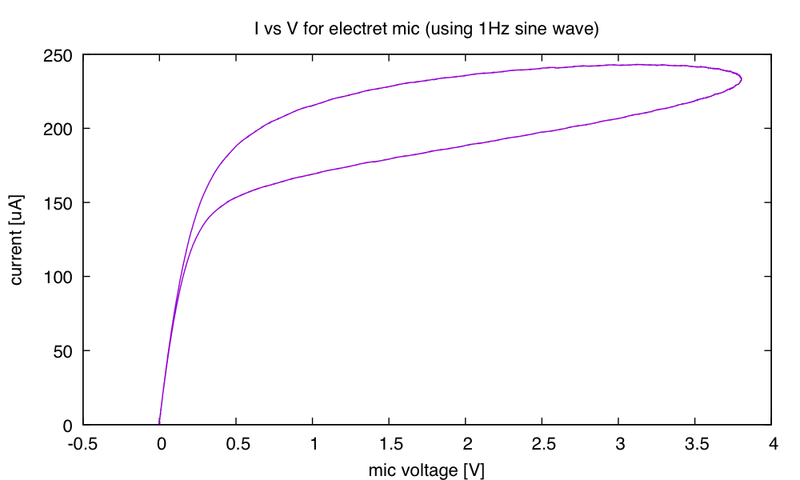 This pretty plot shows the transition from nearly DC (the curve that looks like the first one of the post) to something that looks almost like a resistor, with current going up linearly with voltage, as the frequency is increased. The parallel resistor corresponds to the slope of the DC I-vs-V curve around a bias of 4V. The model fits the data so well that the curve for the data is hidden by the model curve. Like with the 4V DC bias, I got an extremely good fit with the (R1+C)||R2 model. The parallel resistance is different, because the slope of the I-vs-V plot is a little higher (so smaller resistance) at 2V than at 4V. I show only the 2V phase plot here—the 4V one is similar, though the biggest phase shift is -56.5° at 3.5V, rather than -45.1° at 4.6 Hz. 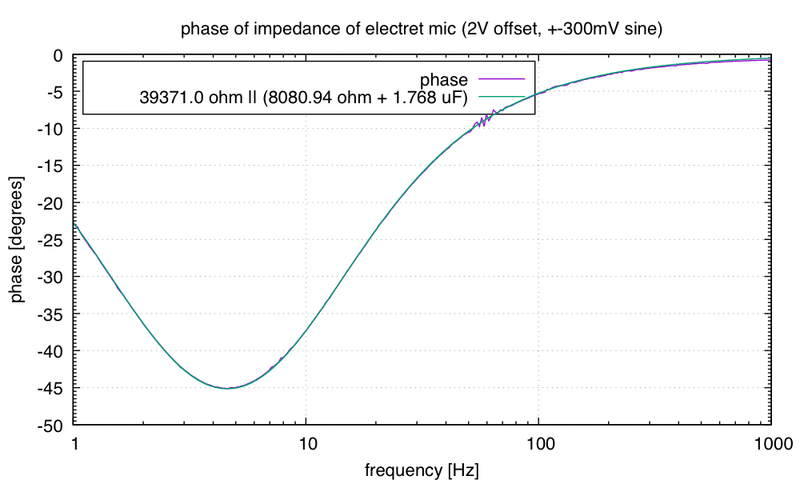 So I have an excellent electrical model of the behavior of the electret mic at a couple of different bias voltages, with a simple explanation for one of the parameters of the model. I’m still mystified where the capacitance (about 1.7µF) and the other resistance (about 8kΩ) come from. I suppose, theoretically, that they could be tiny surface mount components inside the can of the mic, but I see no reason for the manufacturer to go to the trouble and expense of doing that. The pictures of a disassembled mic at http://www.openmusiclabs.com/learning/sensors/electret-microphones/ suggest a rather low-tech, price-sensitive manufacturing process. The 1.7µF capacitance is huge—many orders of magnitude larger than I could explain by a Miller effect (unless I’ve screwed up my computations totally) as all the capacitances for the jFET are in the pF range, and the multiplier for the Miller effect should only be around 5–50 (1–10mS times the 5.1kΩ load), so I’m still at a loss to explain the hysteresis. I checked to see whether the effect was something in my test setup, by replacing the mic with a 10kΩ resistor, but it behaved like a 10kΩ resistor across the full range of frequencies that I used for testing the mic—this is not some weird artifact of the test setup, but a phenomenon of the microphone (and probably just of the jFET in the mic). I suppose I should buy a jFET (maybe a J113, that has a 2mA saturation current with a 0V Vgs) to see if other jFETS have similar properties, connecting the gate to the source with a small capacitor to imitate the electret biasing. The microphone labs this week went OK (much better in the afternoon session than the morning session). 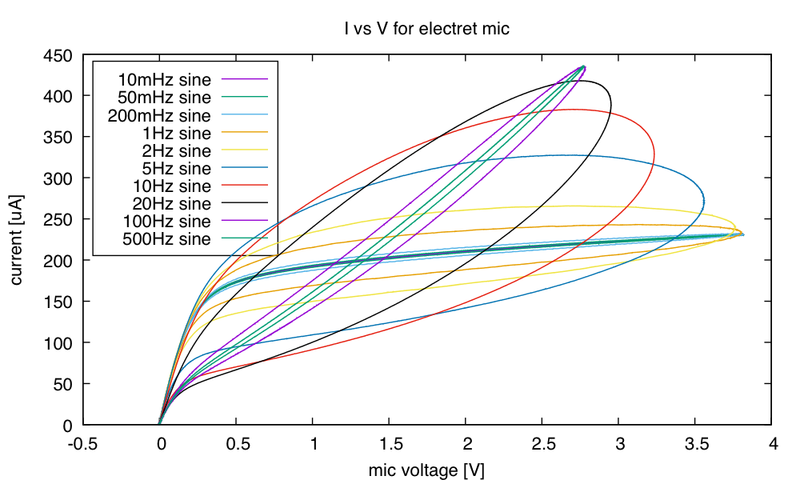 On Tuesday the students collected data for an I-vs-V plot of the electret microphone, both using a power supply and a pair of voltmeters and using just the PteroDAQ system on the KL25Z board (see New modeling lab for electret microphone for the basics of the PteroDAQ portion of the lab). Most groups got all the data they needed on Tuesday, but some were still struggling with it on Thursday. On Wednesday, I went over the model fitting in gnuplot used to produce the fits for the 4 models I gave them: linear resistance, constant current, a “blended model” that is asymptotically the same but switches smoothly between them, and one that adds one more parameter to get a slope for the saturation region(again, see New modeling lab for electret microphone for the models) . Some students in the class asked for a copy of the script I developed in class, but I turned them down—the goal is to get them to develop their own scripts, and they had examples of most of what I did from the previous week’s class, which included a worked example. In previous years, I used to give out all the things developed in class as worked examples, but I’ve stopped doing that, because far too many students just blindly copied and ran scripts without understanding them (often not even changing the parameter values that were different between what I did in the example and the data they collected). One point of this class is to get students to stop thinking of class work as ritual magic that just requires doing the right memorized or copied procedure, and to get them to think in terms of creating new stuff from building blocks that they understand. It is unfortunate that most of the chemistry and physics labs they have had are exactly that sort of ritual magic, with a worksheet telling them exactly what steps to perform and what results to fill in the blanks with. They need to learn to generalize from worked examples, read documentation, and figure out how to make things work. I’m always happy to help them debug their efforts, but not to do the work for them. I’m not in the class to get right answers from the students, but to get them to learn how to design and debug—to ask their own questions and figure out how to answer them. (See Answer getting for more on what change I’m trying to invoke.) Some of the top students are already on board with the concept and are working hard to understand electronics, modeling, graphing, debugging, and so forth , but a number of the students are still stuck in the “tell me exactly what to memorize and what steps to do” state that seems characteristic of many high school students. The biology classes they’ve had have not done much to move them away from that—there is far too much memorization without understanding going on in the bio courses. In addition to the model fitting, I answered questions from the homework—mainly about the calculation of the output voltage from the mic for a given input sound level. I reviewed decibels again and went through the various scaling operations needed to get the output in µV RMS from sound pressure level. I think that the top students got it, but I’m also pretty sure I lost the bottom ones—it’s a little hard to tell as they all work so hard on looking intelligent that I have a hard time telling when they are lost and when they are bored because I’m going too slow. Today’s lab was a little bit of design (choosing a load resistor based on the I-vs-V curve, and designing a high-pass filter to block the DC) and practice using the oscilloscope. I did something different this year, having them design their high-pass filter with the input impedance of the oscilloscope as the “R” of the RC filter. In part this was to get them to realize that connecting a test instrument like an oscilloscope or voltmeter always changes the circuit that is being tested. I even had them design around the 10MΩ input impedance of the 10× scope probe—so the 10MΩ impedance was not “almost infinite” the way many intro electronics courses teach it. I don’t think I made a clear enough point of this message—neither in the book nor in the lab sections, so I’d better mention it in class tomorrow also. Unfortunately, some of the material from the old lab (where they used bigger capacitors and smaller resistors for the high-pass filter) was not edited out in making the changes, so the lab chapter was rather confusing. I’ve left some notes to myself to update the chapter, but I probably won’t have time until this summer. In putting together the book for this quarter, I added exercises to some of the chapters, and I assigned a chunk of them due today as the pre-lab exercise for the microphone lab. I just spent over 3 hours grading the set, just marking questions right or wrong. There were too many questions, and even the best in the class got only 8/11, with the bottom of the class getting 3/11. I think that the class is doing better this year than previous years’ classes, but some of them got discouraged by how much and how difficult the homework was. The amount was certainly more than I had intended, but next week’s homework should be substantially less. I’ll have to figure out how to distribute the load more evenly next year. 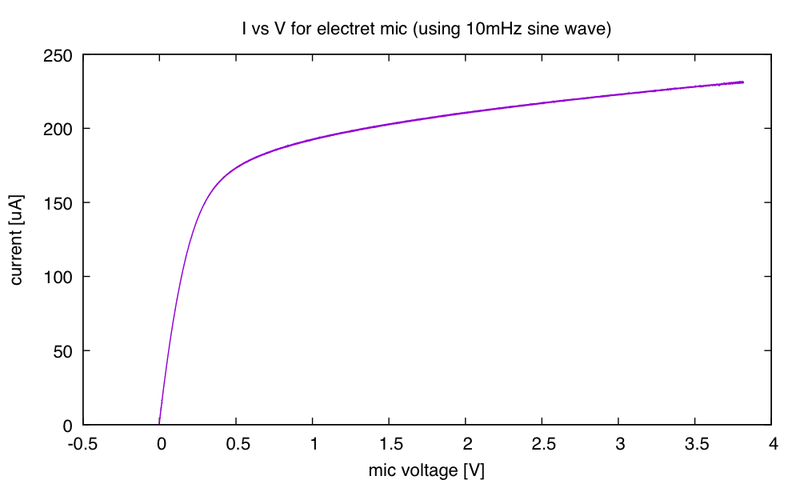 I spent most of today’s lecture going over two of the questions (in response to student request), and I’ll have to do some of the other ones on Wednesday, in addition to showing them how to model DC behavior of the FET in the electret microphone. I may also ask the group tutor for the class to have an extra help session this week. 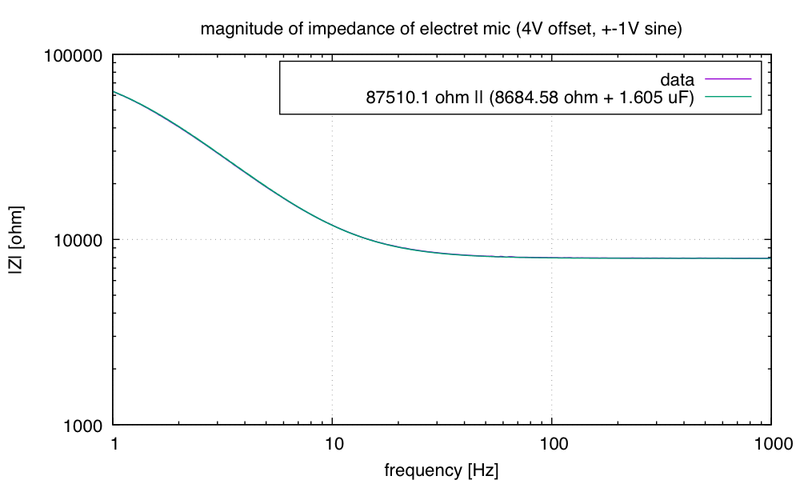 The two questions that got asked about were the modeling of the oscilloscope probe and computing the sensitivity of the electret microphone circuit with a different load resistor. Some of the problems students had were ones that can be easily fixed (like that 1/10000 is 0 in gnuplot, because it looks like integer arithmetic—1/10E3 does the right computation, as does 1./10000). Other problems were fundamental misunderstandings of complex numbers or complex impedance, which may be harder to address.